Susann Thomason Tunick developed an early love of art by being surrounded by the magnificent French architecture in her native St. Louis. She moved to California to pursue her television career and fell in love with the beauty, light and casual lifestyle it offered and made Los Angeles her home. After a successful career in television management, Susann's love of the creative arts led her back to college and she attended UCLA's Environmental Design program. Fueled by her passion, she changed careers in 1989 and created Thomason Tunick Design Associates, Inc.
Susann has endless energy for design. It is her passion to hunt for that perfect rug, table, or lamp that will complete the perfect interior for her clients. She is known for her use of mixing modern with traditional, old with the new, and high end with a vintage treasure. Designs that are one dimensional hold no interest. Her trademark of finding antique and vintage lighting and installing them in a unique way keeps her clients demanding for more. Her extensive knowledge and experience in construction, architecture, landscaping and real estate make her the perfect designer for building new homes or additions. Susann has a team of experts she has worked with for many years and together they’re a well oiled machine. From conception to finish, her projects become alive. She begins each project with a detailed interview of her clients in order to make sure the finished project is uniquely their own. The client's style, passion, travel finds and heirlooms dictate the creative direction of each project. Her professional goal is to beautify the world one house at a time. 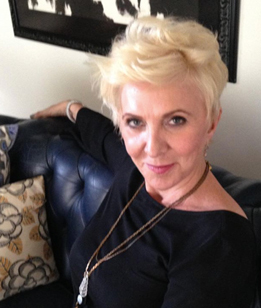 Susann resides in the Los Feliz neighborhood of Los Angeles, with her husband, Michael, and their dog, Bowie. Her artist daughter, Sheri Robinson, lives close by. Her family, friends, travel and nature keep her happy.